I promised that I will publish 4 to 5 tutorials in this series and I will, however there was a bit of gap between this and the last post 😦 but here I am keeping my promise, beware this part is a big one. This tutorial is divided into three parts, in first part, I will discuss OpenLayers, second part, GeoServer, and finally in the last part, I will show an example. But before I can start, I want to bring your attention to another excellent blog post at mangomap.com, its title is “5 things GIS professional need to know about web“. Good to know these things no matter at what level you are. Now the above tips covered, lets discuss Client-Server architecture because web GIS is based on this architecture. In Client-Serve architecture, a software at server side waits for clients to make requests and returns specific information based on request for example like a web site. Thats it for now, you can read more about it here. In web GIS, we need a software (on server side) to read our data (software has to understand the source format of data in order to read), render it in memory (unless raw data is required at client side) and then pass it on to us over the internet. Now, if our data is in shape file format or it is in GeoTif format, it should not be passed due to the client side limitations e.g. shape file is not a web GIS format (plus it will actually be raw data) and GeoTiff could take a lot of time due to size. Thus, this software should send the rendered images in the form of internet friendly formats and we know that there are two image formats which are perfect for internet i.e. JPEG and PNG. Thus, this software should render our data in JPEG/PNG format and pass it on to us over the internet. Ideally, this software should know what area of map we are looking at to render it and send it back to us to avoid rendering all the map, plus this way the size of the image will be small. Thus, when ever we pan or zoom, a new image should be generated and passed on to us. Such a software is called GIS Server and the mapping service is called Web Map Serivce (WMS, read more about it on OGC). Don’t worry, I am not going to ask you to write GIS Server (and implement WMS) because it already exists, in fact we have a lot of good GIS Servers available for example GeoServer, MapServer, Mapnik, QGIS Server and ESRI GIS Server is also in the list (but its not free). In this series, I will only work with GeoServer. Now, I am not going to teach you how to install GeoServer, read part 1 (link ) of this series for “how to install and configure development environment”. However, I just want to past below a paragraph I wrote in first part (I liked it :)). 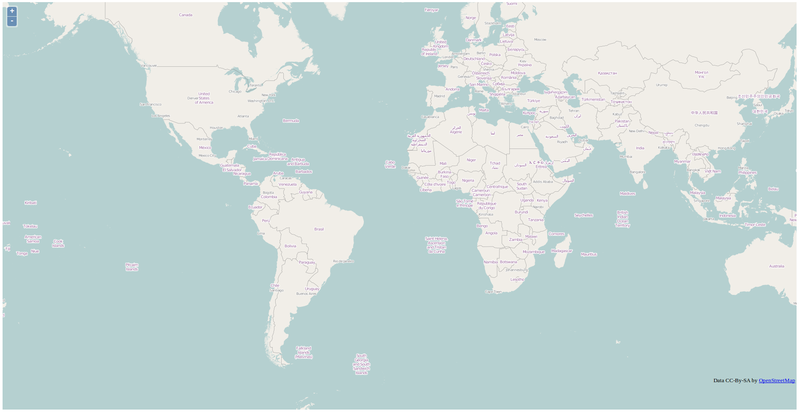 OpenLayers, as mapping API (remember it is for client side), requests map (actually JPEG/PNG tiles) from GIS Server and when GIS Server (like GeoServer) returns OpenLayers shows them in a mapping area (basically in a HTML Div element). When ever we pan or zoom in/out, OpenLayers send a new bounding box to GIS Server requesting for a new tiles. Why I have selected GeoServer, because of its admintration application. The last time I worked with MapServer was in 2010 and the experience was painful. I have not seen a decent administration application for MapServer but GeoServer has address this issue excellently. Plus the GeoWebCache is also integrated into the GeoServer and can be accessed through admin application (I will talk about it at the end of this tutorial). 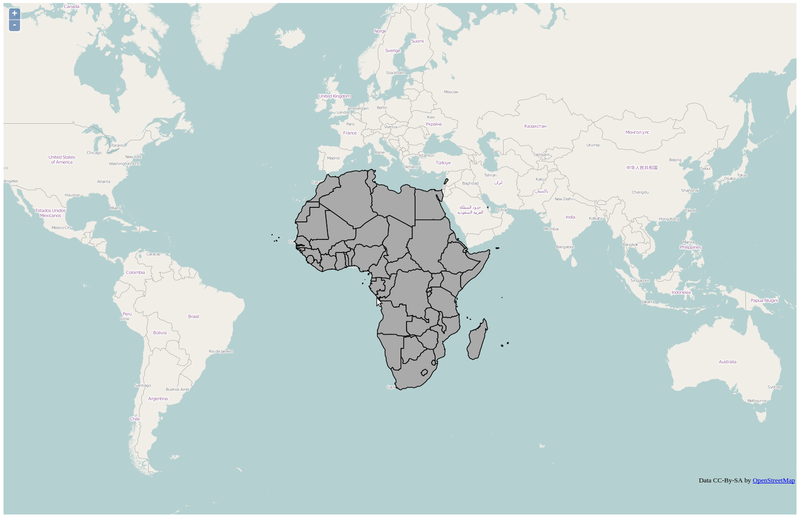 will be overlaying it on OSM base map which is in spherical Mercator. or see Lession 4 of Pennsylvania State University “Open Web Mapping” course (its good). 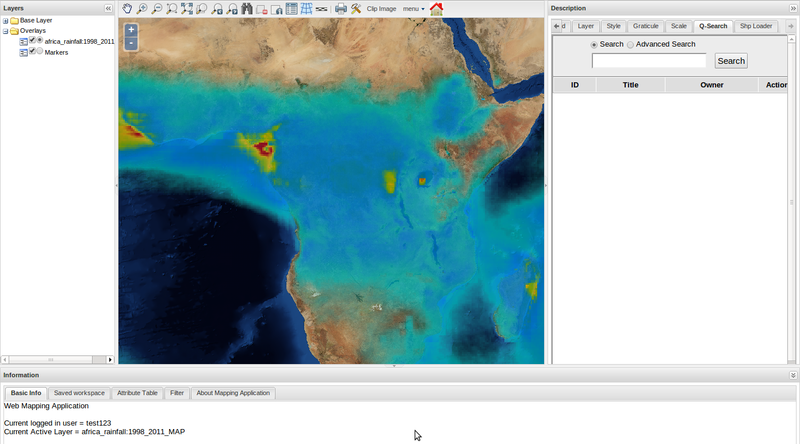 What you are looking at is a web GIS application (Yes it is, simple and small but “A web GIS application”). It has controls (or components) like Map, zoom/ pand , mouse control and few more. All these controls are provided by OpenLayers API. But wait! We haven’t installed OpenLayers, when was it installed. When you installed GeoServer, the installation has its own web server and OpenLayers, thus, it is using these two to show preview pages (see I told you, GeoServer has it all). The first line is creating an object tiled (just a variable name) of WMS class (of parent class Layer), the constructor for WMS class takes layer’s title, URL , name, format, isBaseLayer, transparent etc as arguments (don’t worry with time and a lot of reading you will understand all of it ;)). We need to add our layer’s code below the OSM layer and add it on to the map but first we need to make two changes to our code. I have also added “tiled” layer to map object (fourth line from bottom). Now save code and open http://localhost/myapp/myapp.html in any web browser (as discussed in part 2) and when I did, I got the following output. In next part, I will discuss more about GeoServer and layer styles. Its time to create a web GIS application. When I installed apache web server, a folder was created in /var folder i.e. www. I created a new folder in /var/www folder named it myapp and inside my app I created an other folder known as lib (/var/www/myapp/lib). All libraries will go into this folder (keeping our code manageable). I downloaded OpenLayers from its web site. Unzipped it into my lib folder (/var/www/myapp/lib/openlayers). I wrote a small html web page (myapp.html) and added OpenLayers to it for demo web GIS application, following is an explanation of it. We need to load OpenLayers library into our html page, for this we will use the following line in header section of our html page. Note: You can link OpenLayers library from their web site but I think serving it from your own local web server is better. A DIV element is required to embed map into an html page. Why DIV because contents inside DIV can be updated without updating the host html page, thus, when we zoom in on a map only contents of DIV are updated. Following is html code for DIV element. Now, when myapp.html will be loaded, init() function will be called and map will appear in web browser. Now every thing was set, I opened http://localhost/myapp/myapp.html in my web browser and got the following output. I know that init() function needs explanation, thus, lets dissect it. Second line creates an OpenLayer map object and pass our DIV map as argument. Now our DIV will be a canvas for drawing tiles and will also respond to mouse drag and double click (along with my more functionalities). Third line creates a layer object and this layer object is specific to OpenStreetMap (OSM). What is happening at the backend is that code is requesting OSM mapping servers for maps (basically WMS). Don’t worry I will explain WMS in next tutorial. Fourth line is adding the newly created layer to map (see reference to newly created layer is passed in the addLayer()). Finally, in fifth line, map was centered at 0,0 and zoom level 2 was set. In Next tutorial, I will talk about GeoServer’s role in a web GIS application (with example) and its further use. PostGIS installation, configuration and usage and some JS GUI libraries. Many people asked me about web GIS development and from where to start. Some questions were basic like ‘how to show a shape file on Google maps’ to advance level as ’tiles are coming from local tile cache or GIS server’. Since I am into Open Source web GIS application development, thus, I decided to write a blog about it that can help the beginners and answer some medium to advance level questions. Package updates are required, thus, do the following. Note: Remember, answers to questions on console are case sensitive. 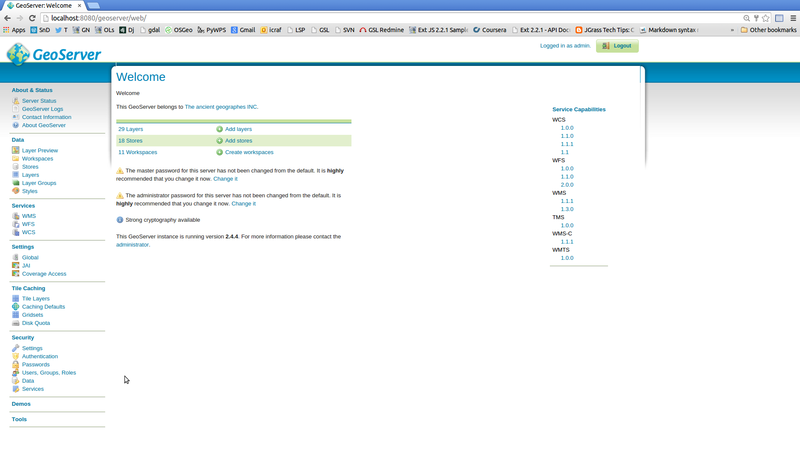 I like Google Chrome because it has an easy to use debugger, thus, installed Chrome using synaptic package installer. Keep in mind, chrome for Ubuntu 64 bit is only available for AMD by-default. To keep a backup backup of some important files, I always use Dropbox. To install Dropbox, python-gpgme package needs to be installed (again using synaptic package installer) for verification of binary signature. Finally, I downloaded Dropbox installation package and installed it. This file is to be changed if one wants to change port 5432. Do not forget to restart PostgreSQL server load the new settings. Now web server needs to be installed, I selected apache, used synaptic package manager to install apache (version 2.2.22-1ubuntu1.4). This will create a folder ‘www’ in folder /var/. We will use the www folder when we will create a test web GIS application later in this tutorial. If you want to use php as server side development language, install php module for apache server. Just use synaptic to install libapache2-mod-php5. Also install (using synaptic) php5-pgsql module to use postgreSQL with php. Restart apache (use command below) to load these modules. Finally it is time to install the most important component of Web GIS application i.e. GIS Server. It is important to know what a GIS Server Is? It is a software that listens for specific request (by clients). These requests could be for different services (read OGC specification on GIS server for details) e.g. getMap request etc. A GIS server loads a dataset (e.g. a shape file or a Geo-Tiff) renders it, cut image into tiles and sends it back to the requesting client. Every time a client pans or zooms, GIS server receives requests and sends image tiles as response. Format of image tiles is specifically selected due to its size. In Free and Open Source Software for Geo (FOSS4Geo) there are multiple choices for GIS Servers e.g. MapServer, GeoServer, mapnik. qGIS server, MapGuide etc. Some are written in C and some are in Java. GeoServer has an edge over others because of its administration tool i.e. web based administration interface. With GeoServer, deploying a dataset (let say a shape file) as a WMS is very easy. Thus I decided to install GeoServer. Before installing GeoServer, Java needs to be installed as GeoServer require Java. I used synaptic package manager to install openjdk-6-jre. Then downloaded GeoServer from its web site. Unzipped the downloaded file into a folder. Moved to bin folder and edited startup.sh file to add JAVA_HOME variable as shown below (your path might be different). Note: Do not close this terminal this terminal window because it will shutdown GeoServer. Started a web browser, and typed http://localhost/geoserver to open administration application and used admin as user name and geoserver as password. Application menu is on left side, clicked on Layer preview to view sample WMS layers. One can click on Open Layers link against any sample layer (as shown in figure below) to open it in a new tab. Please read GeoServer user manual to know how to deploy your datasets as WMS layers (I will create a WMS in next part of this tutorial). In next part, I will also create a web GIS sample application using Open Layers and explain web GIS application functionality.